http://www.JewishWorldReview.com | Tu B'Shvat (the 15th day of the Hebrew month of Shvat, which is today) is known as the "birthday of the trees" to Jewish children around the world. It has become a little bit like Jewish Earth Day, with tree-planting as the main event. Compared with other Jewish holidays, many of which commemorate freedom from oppression or a covenantal pact between the Jewish people and the Creator, Tu B'Shvat may seem a little, well, light. "Now all the trees of the field were not yet on the earth and all the herb of the field had not yet sprouted, for G-d had not sent rain upon the earth and there was no man to work the soil. A mist ascended from the earth and watered the whole surface of the soil. And G-d formed the man of dust from the ground..." (Genesis 2: 5,6). While G-d endowed human beings with primacy over nature, this passage shows there is a clear duality to the relationship. Rashi, perhaps the most famous of the Torah's commentators, notes that the first man, Adam, immediately recognized his spiritual responsibility to pray for rain, which was needed for trees and vegetation to spring forth. And, just as vegetation could not sprout without water, so, too, G-d seemed to water the earth from which Adam would emerge. Even in the midst of war, Jewish values come into play, prohibiting the senseless destruction of fruit-bearing trees. "A tree is not a soldier," Rashi noted. "Why should Jews feel the need to deprive anyone of the trees' fruit?" The Maharal of Prague adds a deeper meaning to the comparison. Just as trees must grow branches, twigs, flowers and fruit to fulfill their purpose, he explained, so too man was put on earth to be productive and labor to produce moral, intellectual, and spiritual truth. This is why the sages refer to the reward for good deeds as "fruit," because they are the true product of human growth. Tu B'Shvat also celebrates the bond between the land of Israel and its people, although notably, the classical commentators never wrote that tree-planting was necessary on the holiday. Planting trees was, however, mandatory when making a physical connection to the land of Israel. A Midrash (Vayikrah Rabbah 25) states: "From the beginning of the creation of the world (G-d, so to speak) busied Himself with nothing but planting, as it says, 'And He planted a garden of Eden.' So too you when you enter the land, don't busy yourself with anything but planting at first." When the modern state of Israel was established, Jews began to follow this advice with a passion. Only since Israel's independence has existed has Tu B'Shvat become synonymous with planting. It's possible that the consistent forestation of Israel, emphasized each year on Tu B'Shvat and year-round, has kept more of the land in Jewish hands during times of war. Consider: Areas surrounding Jerusalem and in the Galilee might have been settled by Arabs if they had been less heavily wooded. In this sense, the tremendous effort in tree planting throughout Israel may have done as much to "root" ourselves in the land as have the efforts of Zionist organizations. In celebration of our connection, it is customary on Tu B'Shvat to eat fruit that grows in Israel, specifically, olives, dates, grapes, figs and pomegranates. It is also customary to eat a new fruit, which one hasn't eaten yet this year, in order to make the special shechechiyanu blessing on it. Several hundred years ago, the great Kabbalists who lived in Tzefas (Safed) wrote a Tu B'Shvat haggadah, which is commonly used in Israel today for a "Tu B'Shvat seder," complete with four cups of wine, the fruits and grain products of Israel, and blessings over each fruit. The first cup of wine is white, symbolizing winter; red wine is added to subsequent cups of wine, symbolizing the inevitable arrival of spring and the renewal it brings in nature. These Tu B'Shvat "seders" are a cross-denominational phenomenon, with both secular and religious schools participating in them. The great Maharal of Prague said that a man is like a tree of the field because just as the ground is all potential, so too is man is all potential. That's why the first man was named Adam, which is rooted in the word which means "earth" in Hebrew, adahma. Man's potential is actualized through his personal, intellectual, and spiritual growth. 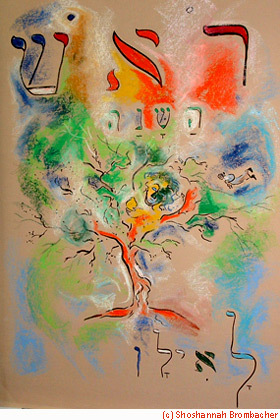 Paraphrasing the Maharal, the only difference between man and the trees is that the roots of the tree are in the ground, while the roots of the man are in the heavens. Tu B'Shvat is a day when we remember the budding growth lying dormant in the winter earth, and celebrate spring's incipient arrival. We celebrate the Land of Israel, which the Torah has praised as "a land of wheat and barley and vines and fig trees and pomegranates, a land of olive trees and honey" (Deutoronomy 8). We, who are compared to trees of the field, therefore rejoice on Tu B'Shvat, the day where the land of Israel renews its strength to give forth its riches. And may we grow like the trees, strong, rooted, reaching towards higher spiritual and intellectual growth. growth. JWR contributor Judy Gruen is the author, most recently, of "The Women's Daily Irony Supplement". Her work has appeared Los Angeles Times, Chicago Tribune, Washington Times and many other publications.